This despite the fact that those who support the Brotherhood often employ terrorism, including al-Qaeda and other jihadi organizations; this despite the fact that, since the ousting of the Brotherhood and Morsi, Egypt has been engulfed in terrorism; this despite the fact that the Brotherhood and their supporters targeted Egypt’s Christians, destroying around 80 churches in a few weeks. Meanwhile, Maj. Gen. Sisi, the man who ousted the Brotherhood to massive praise in Egypt, just went to Russia to meet with President Putin, as the U.S. continues losing one of the Mideast’s most strategic nations. In Russia, the Muslim Brotherhood is a banned organization. The Muslim Brotherhood was founded in Egypt; and many fellow Egyptians — both Muslim and Christian — know that it is involved in terrorism. Russia and many other nations also know this. But apparently not the United States. The other possibility is that the U.S. government does know of the “nefarious” nature of the Brotherhood, but is allied to it anyway. 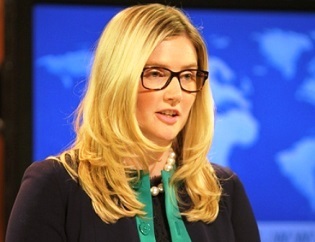 During the same conference, Harf said that contact between the U.S. embassy in Cairo and the Brotherhood is ongoing. Much of this was revealed in the context of Ahmed Eleba, an employee of the U.S. Embassy in Cairo currently arrested for, among other things, his close ties to the Brotherhood, including Khairat al-Shater. Currently imprisoned, al-Shater is the deputy leader of the Brotherhood; along with Morsi and other top Brotherhood leaders, he is being tried for, among other things, direct ties to terrorism. Filed Under: Other Matters Tagged With: Egypt, Muslim Brotherhood, U.S.